This is the schedule for our 1-day training session. We train you in all the aspects of vehicle wraps, from preparation to post care. Any person interested in the vehicle wrap industry and wants to become a professional, Apple Graphics training is for you! Apple Graphics is staying busy with Vehicle Wrap Training. All the sessions up until January 25th are booked, which we still have 2 openings for. We also added an additional training day on the 12th of this month to accommodate some future Wrap Installers. Apple Graphics is a convenient and easy travel for areas within 200 miles of us along the East Coast. All cities and suburbs in Pennsylvania, New York, Delaware, New Jersey, Maryland, West Virginia, and Virginia have an easy, enjoyable car ride to Apple Graphics. Any person living in this proximity will not have to deal with any additional travel days nor a plane ride. It will be a one-day event! We are located just outside of Philadelphia. 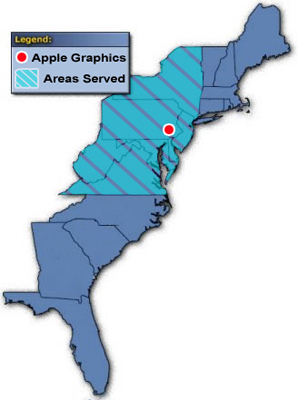 This map shows the proximity of Apple Graphics in relation to the East Coast. If you happen to arrive in the area the night before, instead of traveling early in the morning, there is a Holiday Inn right around the corner from our shop. Apple Graphics Vehicle Wrap Training consists of a full day of wrapping. In the morning we supply coffee to get a fresh start to the day. Our Wrap Installers will show you how to use our equipment, which includes a Mutoh ValueJet Large-Format Printer and a Seal Pro S Laminator. Once the prints are ready to be installed, we will then show you and guide you in the Vehicle Wrap process. First, preparing the vehicle or trailer to get wrapped by cleaning and removing any decals. Second, our installers will guide you in placing the digital vinyl prints on the vehicle. When the print is straight and set where it should be, you will begin to apply it with a squeegee and a torch. Throughout the entire process of applying the vinyl prints, our Wrap Installers will guide you and show you different techniques to use. After the digital prints are applied, then you trim it out and cut off all the excess vinyl. In Apple Graphics Training, we have you learn to wrap a trailer and a vehicle, usually a Car, SUV, or Truck. Lunch is supplied by Apple Graphics, as part of the training. Our training consists of a full day of learning and wrapping vehicles, so when you are completed then you will be a pro. Our Wrap Installers are trained by the best Certified Installers in the world, so you will be getting the best Training available! Apple Graphics has 2 openings for the next Vehicle Wrap Training on January 25, 2010. We are having a Special Holiday Offer at Apple Graphics. The first two people to sign up for the Vehicle Wrap Training for January 25, 2010 will receive the Starter Supply Kit absolutely FREE! The Starter Kit has a value of $250, which will be deducted from your overall cost of the Training. 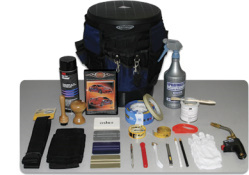 All the tools you need to wrap vehicles are included in the Kit, and you will get it FREE! The standard cost of Vehicle Wrap Training is $1175, but you will only pay $925 for this January Training! 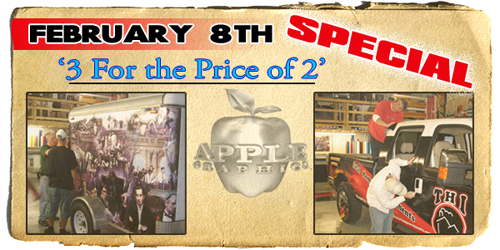 This is a special, one time offer at Apple Graphics. You can sign up and get trained in vehicle wrapping at an unbeatable price! There are only 2 open spots for this January Training, so don't delay and sign up NOW!